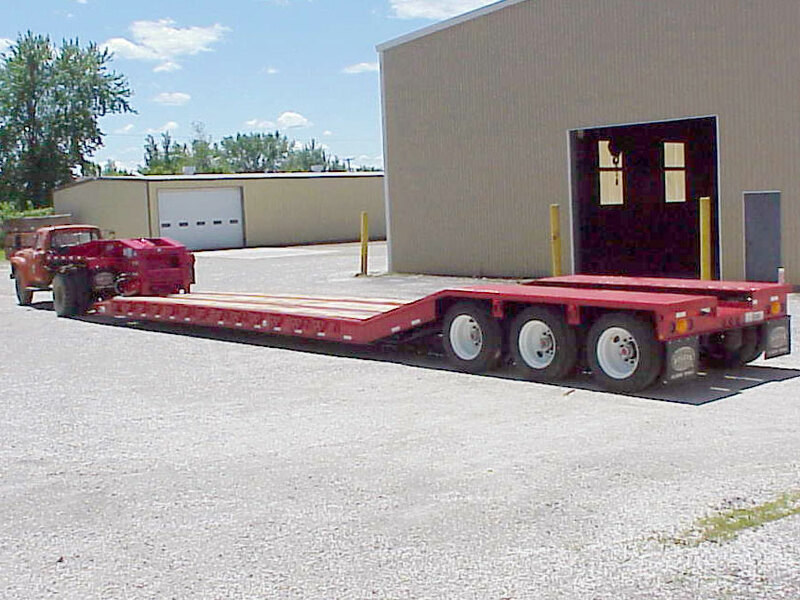 This SP60GR-3XAR is a 60-ton capacity "Gentle Riser" equipped with the patented "No Foot"® detachable gooseneck with a heavy-duty lift package and gooseneck fenders. The platform deck has a 16° slope to the rear frame, covered with full 2-inch oak decking. The center cover plate is depressed the full length of the slope and rear frame, which has 1/4" tread plate wheel covers. The rear channel is lower to creat a "boom trough" for an excavator. "New York State Wide Load" rear lights include 7-inch amber strobes. Deck toolbox with a wood cover is storage behind the gooseneck. Controls for the Safety Lights package are on the driver's side of the deck. The heavy-duty swinging side brackets are hooked in place until needed.